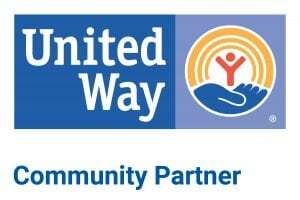 The full version of the United Way logo should be used whenever possible. A one-color logo (blue or black) is available for professionally printed pieces. Logo may not be printed in colors other than blue (PMS287) or black. When in doubt, use black. There is a special-use version of the logo. Please call for permission to print this version of the logo. Right click on image you wish to save and hold on the linked image until you see a pop-up menu. Select “Save image as…” and select where you would like the file to be saved. The “Save as Type” field should display JPEG (*.jpg). 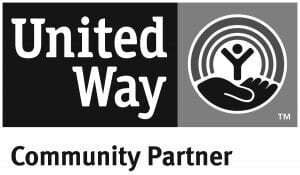 When resizing the logo: (Do not reduce the width of the United Way brandmark to less than .75 inches for print or special usage or 1.25 inches for screen applications.) The logo should always be placed on the right side of printed materials no closer than half the symbol square from the edge of the material. Insert the logo into the document. Click on the logo. A box will appear around the logo. Click on a corner of the box and drag the mouse until the correct size is achieved. 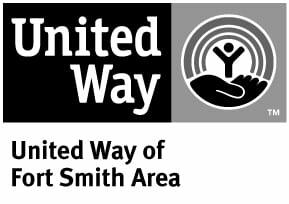 Any questions on use of the United Way logo, please call us at 479-782-1311.